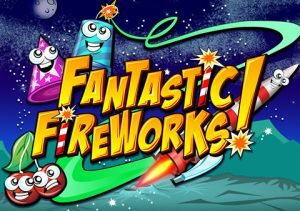 Hope for some explosive wins in Fantastic Fireworks, a 5 reel, 10 payline video slot from IGT. This colourful display comes with floating symbols, exploding symbols that award extra floats, a free spins feature and a pick me round. Play on all devices from between 20p and £600 per spin. With a cityscape silhouette and the night sky in the background, you’ll see 7 brightly coloured cartoon firework symbols on the 5×5 reel grid. There’s also a wild. Instead of dropping down, the symbols float up into place. Land 3 on a line to create a winner. Exploding symbols are central to the action. A chain of 4 matching symbols create a Boom symbol which explodes all the adjacent symbols. New symbols float up and replace the old and a new payout follows. Landing a chain of 5 matching symbols creates a Super Wild symbol – all instances of the symbol that features the most times on that spin are then exploded. If you land intersecting winning combinations, you’ll create a Criss Cross symbol. This explodes everything on the row and column from that winning combination. In all cases, Exploding Symbols can replicate to create even more winning opportunities – this is known as the Floating Reels feature. Free Spins Bonus feature – here you’ll be awarded 8 free spins. Special symbols will hit on each of those free spins to boost your winning chances. Hope to see the sparklers too – after you’ve collected 10 of them, you’ll receive 4 extra free spins. Cannon Bonus feature – land this round and you’ll be offered a selection of 6 firework cannons. Choose 3 of them to reveal cash prizes. If the cannon produces a ray of light, you’ll get an extra pick. The theme here might be an explosive one but that’s not really the case as far as volatility goes. The variance here is in the medium to low range. IGT has created a good-looking video slot though – the bright colour scheme matches the fireworks theme nicely. There’s plenty of gameplay here too and you can expect to see a steady stream of smaller wins from the floating and exploding symbols – the most you can win from each spin/free spin is 524 times your total bet. The slightly unusual game engine in Fantastic Fireworks takes a little getting used to. Once you have, there’s enough here to have you oohing and aahing at the pretty patterns (and payouts) lighting up the sky. If you like fireworks, you cannot go wrong with the more volatile Esqueleto Explosivo from Thunderkick.